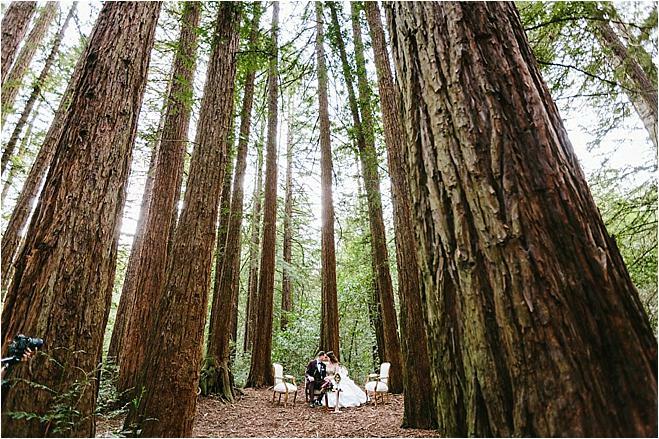 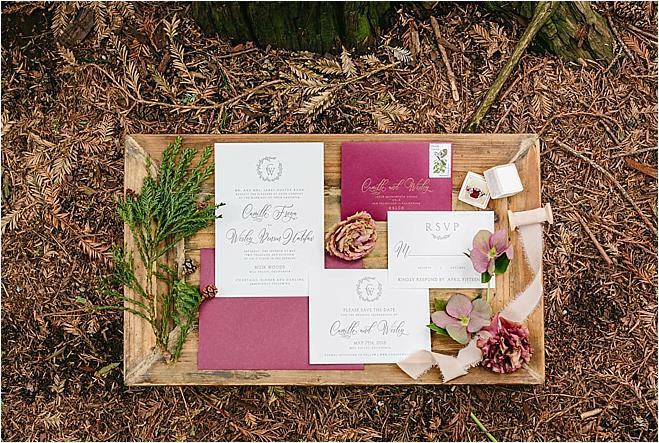 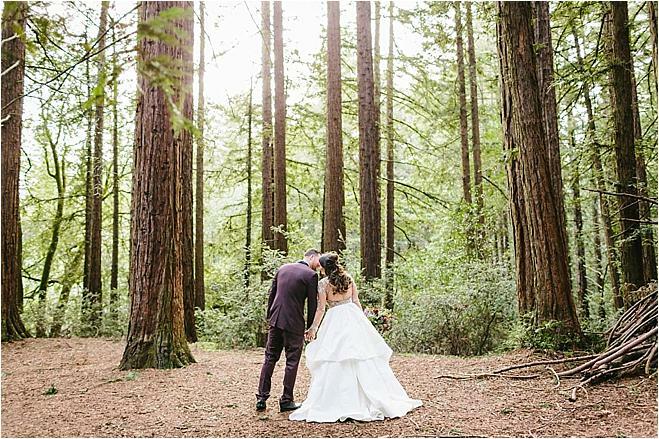 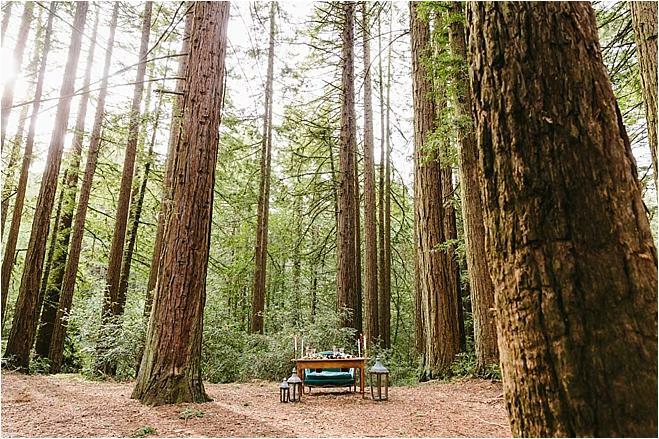 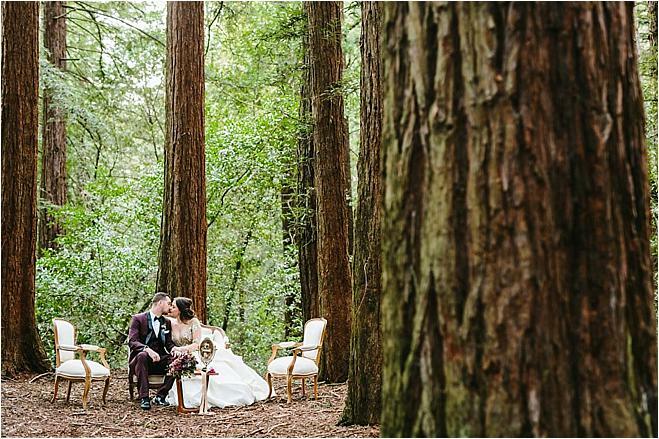 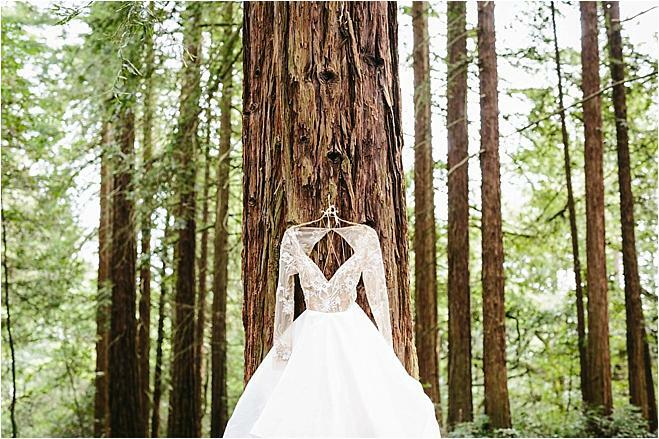 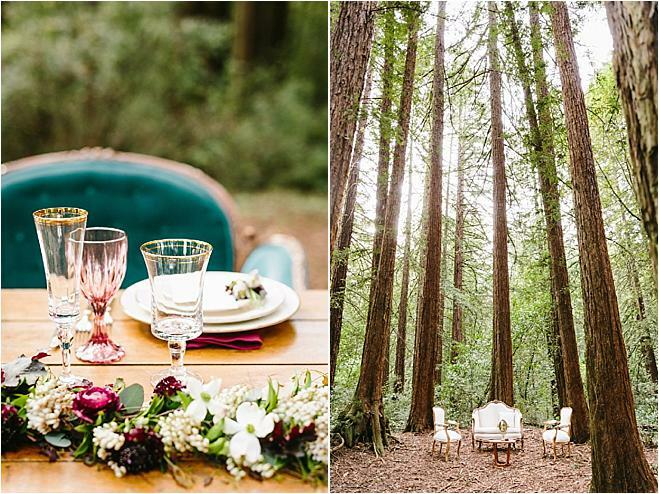 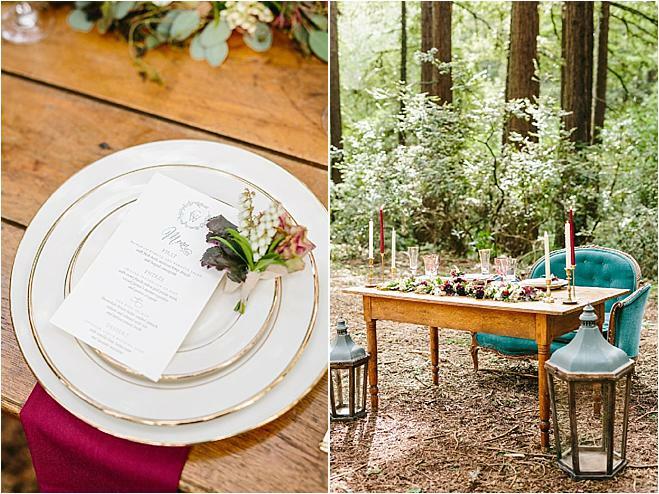 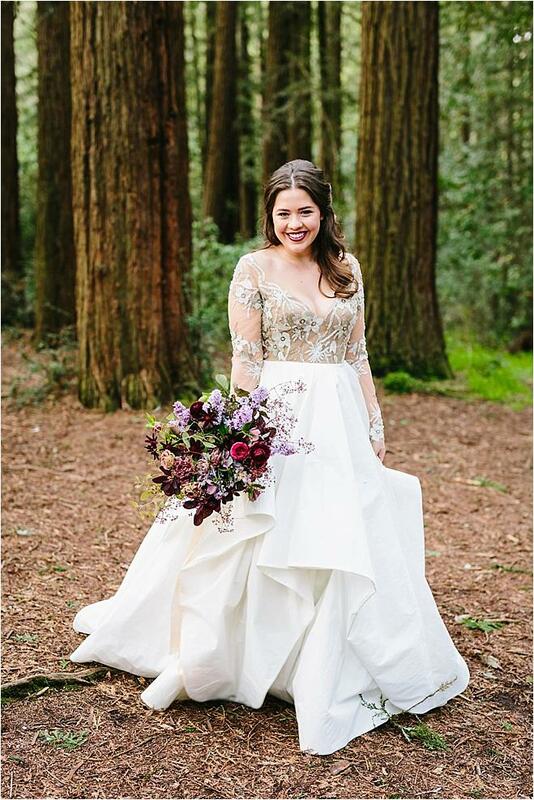 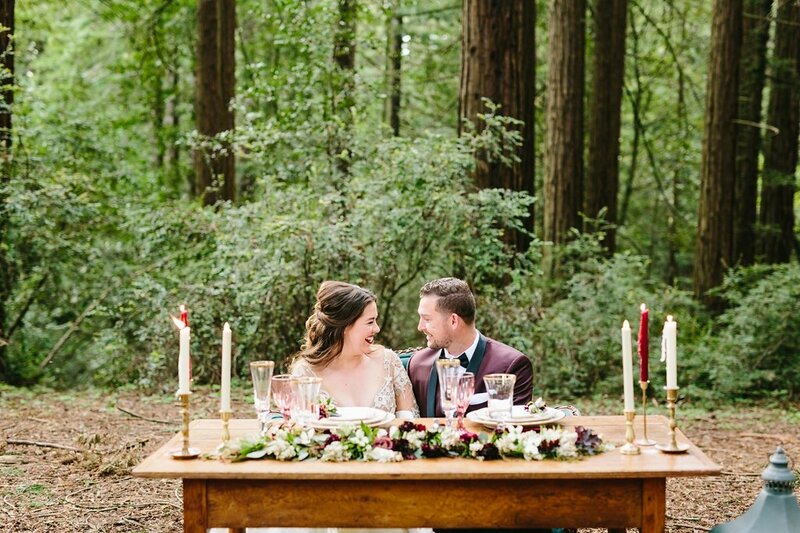 Inspired by the classic tale of Little Red Riding Hood, this styled shoot in Joaquin Miller Park put a unique modern twist on the original story- the perfect inspiration for any and every princess bride. 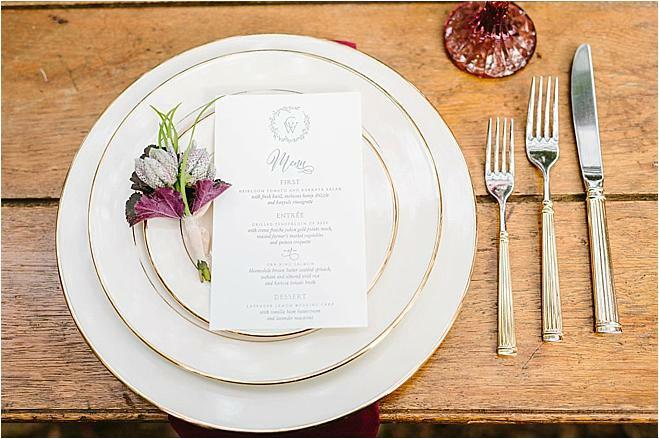 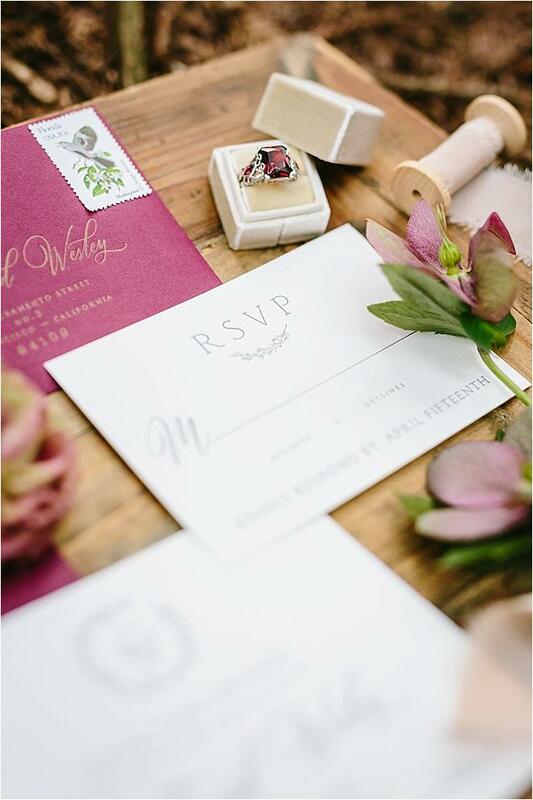 A beautiful invitation suite by Aerialist Press encompassed the elegant feel of the shoot and a divine vintage ruby ring in a pretty box from The Mrs. 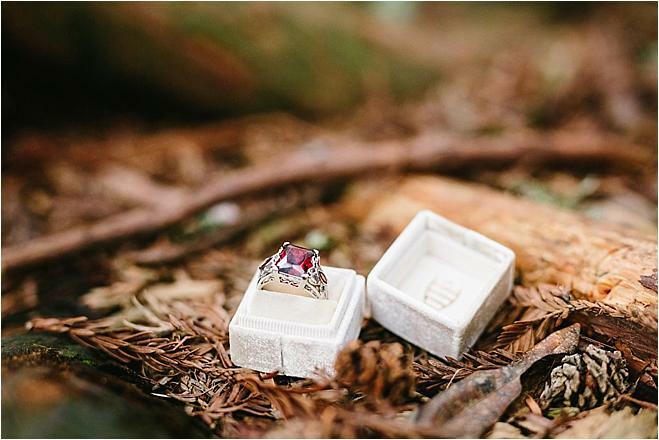 Box accented the fuchsia tones. 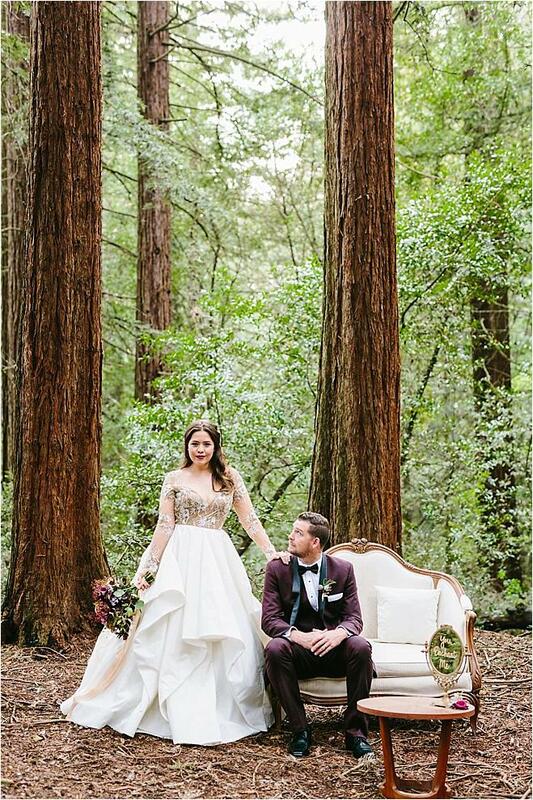 The bride and groom stunned in elegant attire with a hint of whimsy. 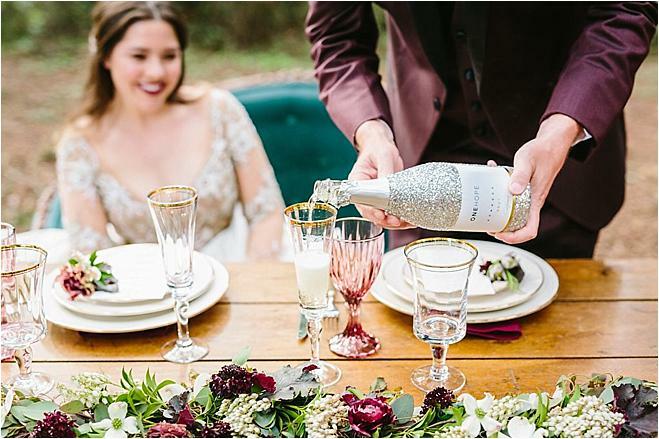 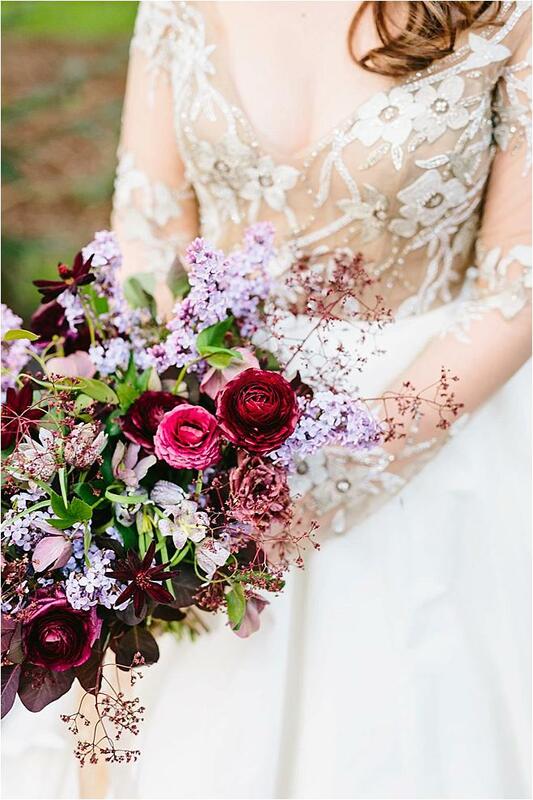 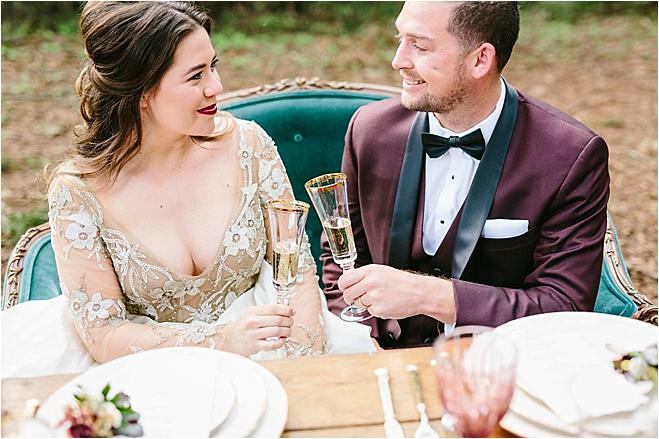 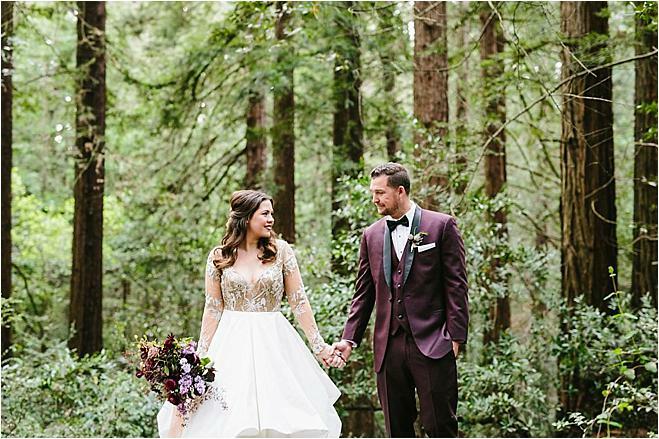 The bride wore a magical Hayley Paige gown with a beaded bodice and long sleeves, while natural makeup paried with a bold lip by Brides by Amy completed the look. 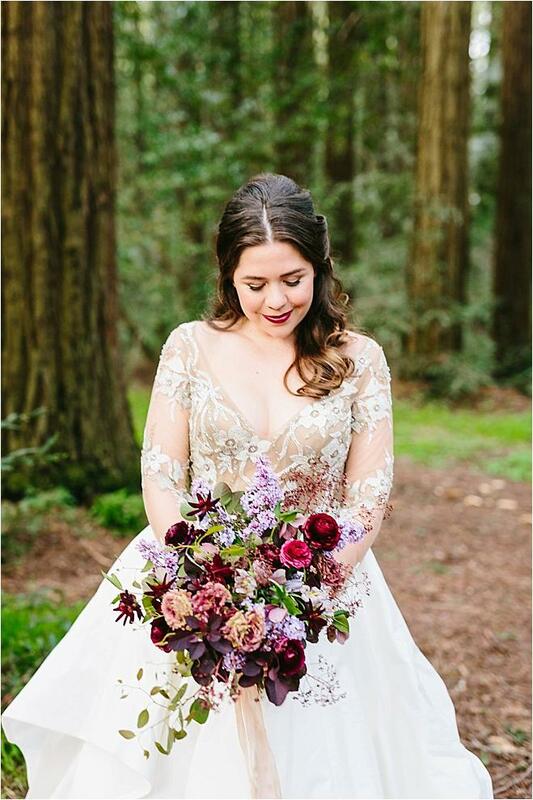 An exquisite bouquet from Flower Girl Em showcasing purple and pink blooms accompanied by sprigs of greenery set the tone for the shoot. 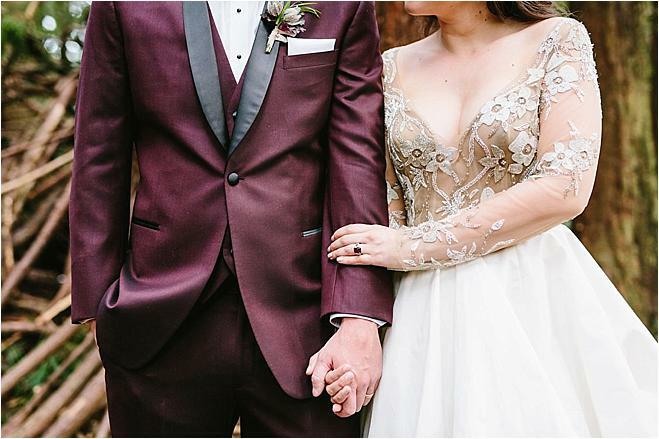 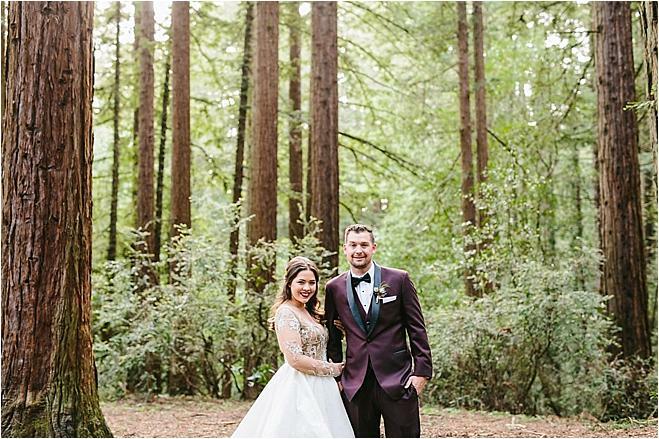 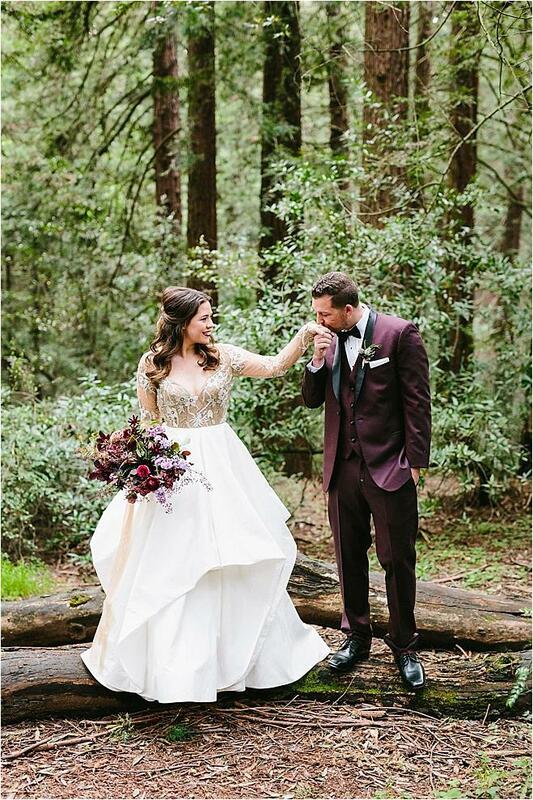 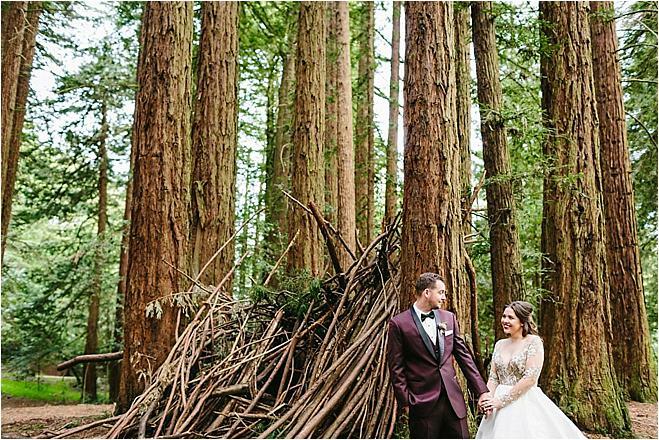 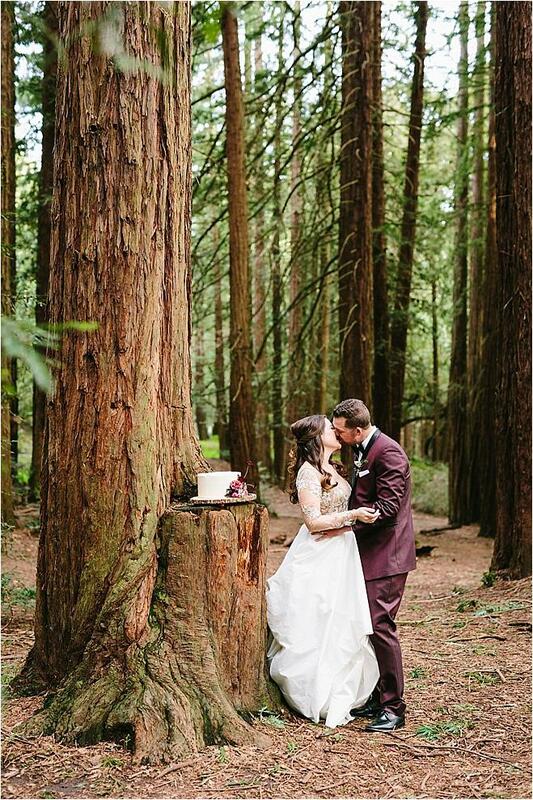 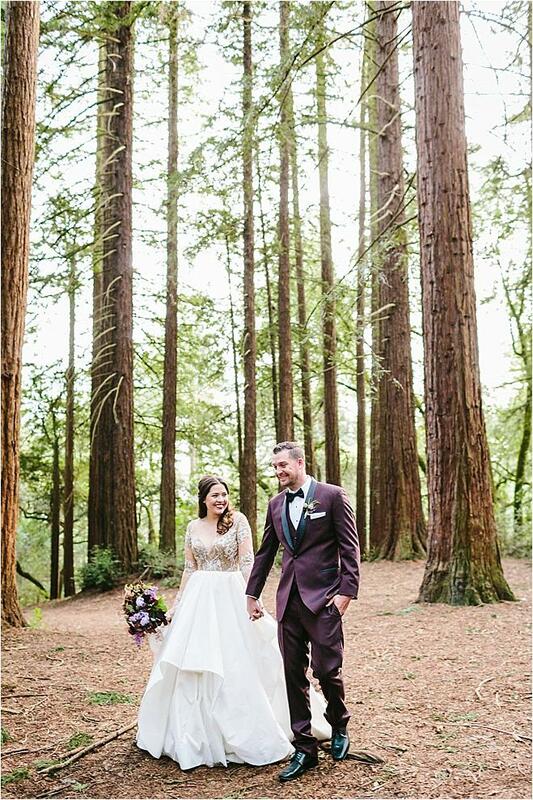 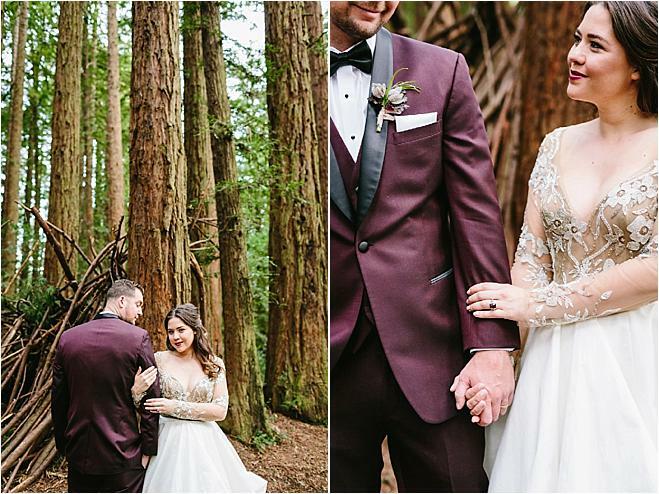 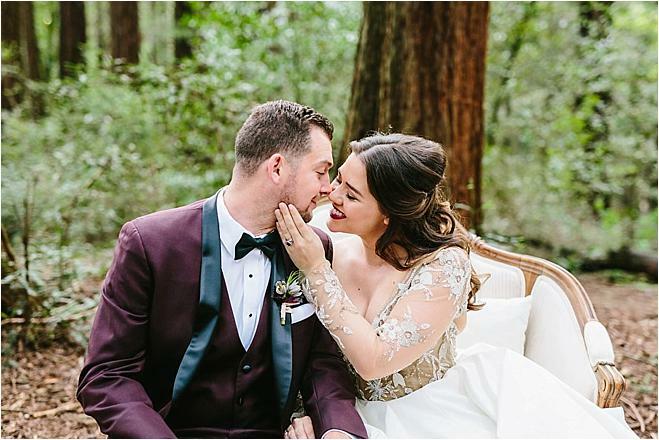 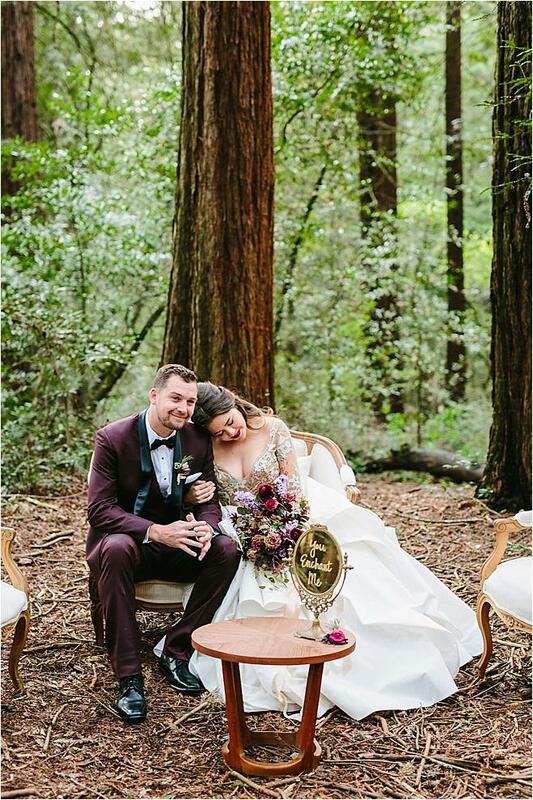 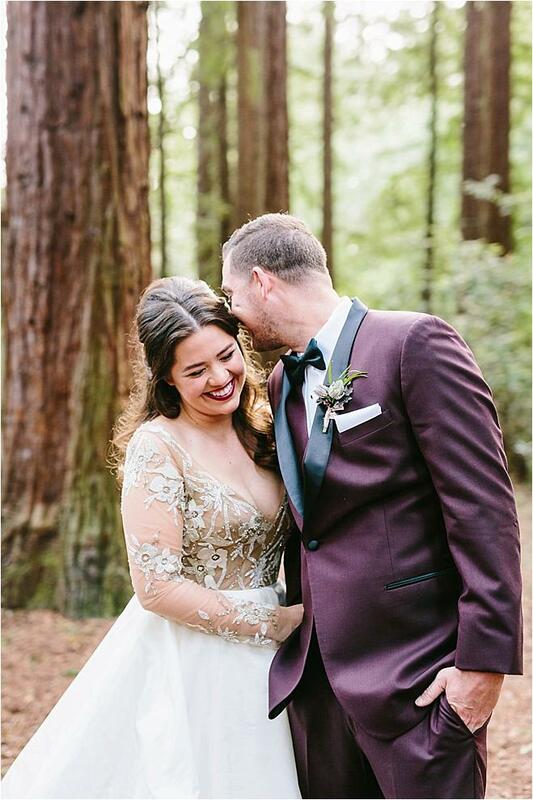 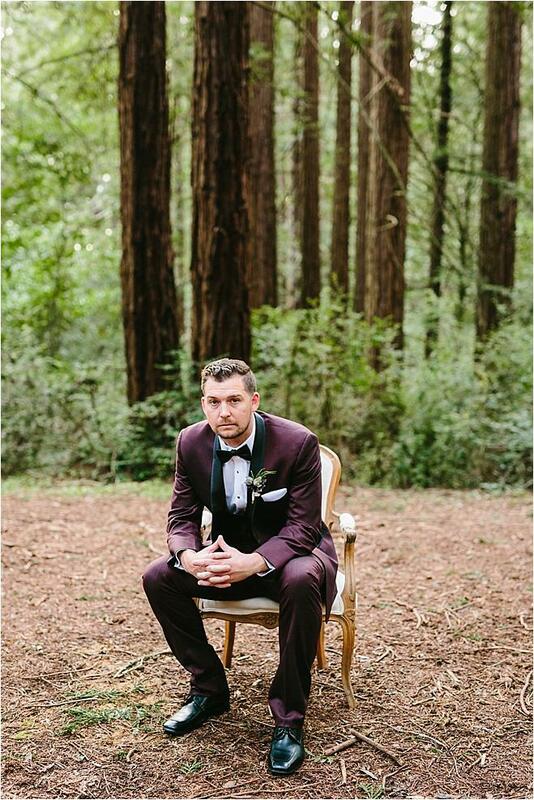 The groom's dapper burgundy tux from Friar Tux Shop made for a vibrant pop of color among the neutral hues of the forest. 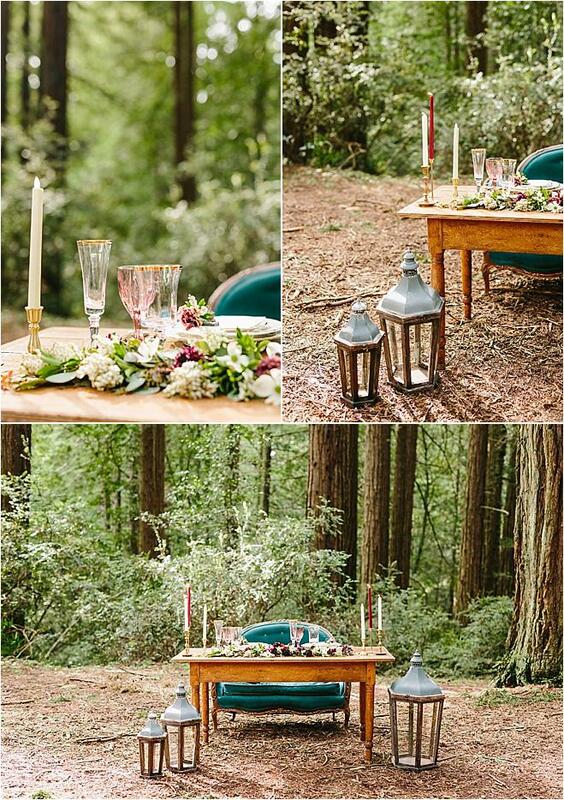 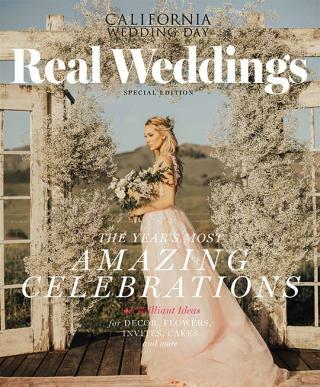 CMG Weddings & Events set out to bring the dream of this shoot to fruition. 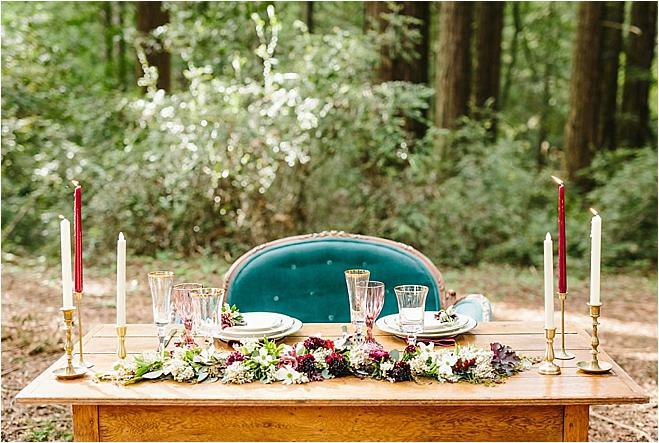 A pretty sweetheart tabletop display boasted a jewel-toned design highlighting a stunning teal tufted loveseat from Pieces by Violet and romantic decor from Bright Event Rentals. 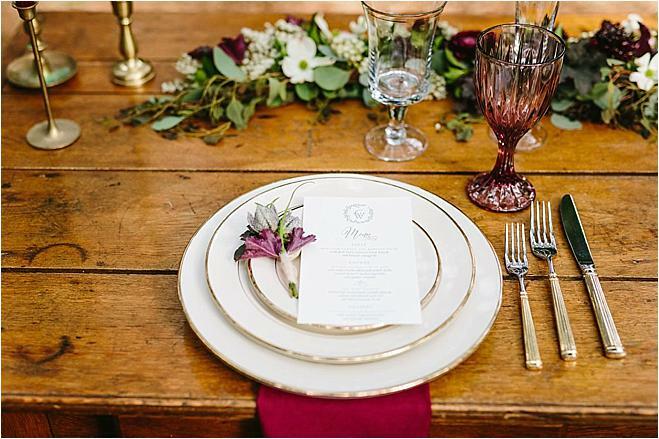 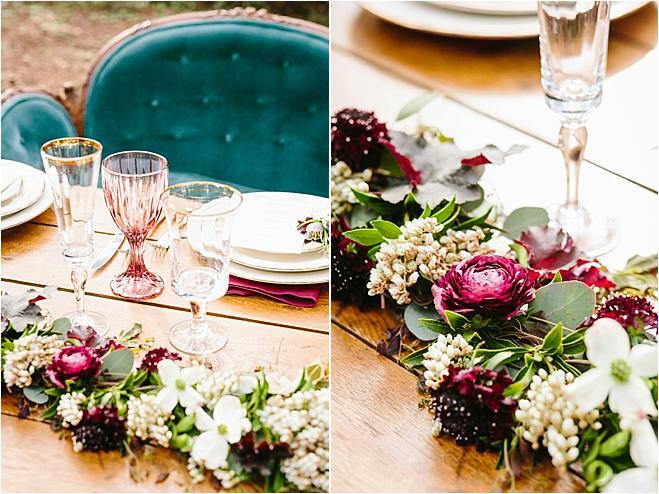 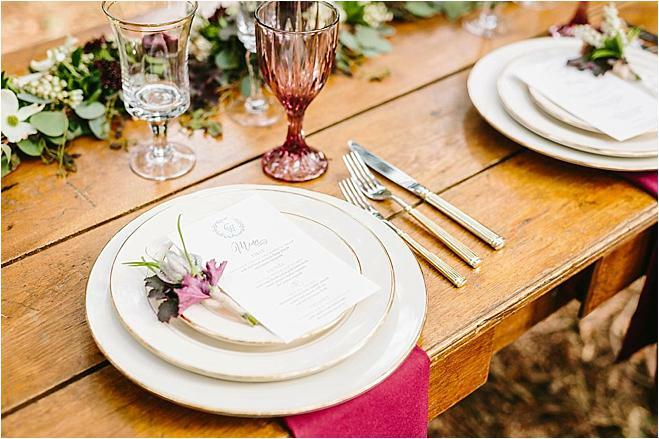 White plates with hints of gold and dainty glassware popped alongside a bright floral runner. 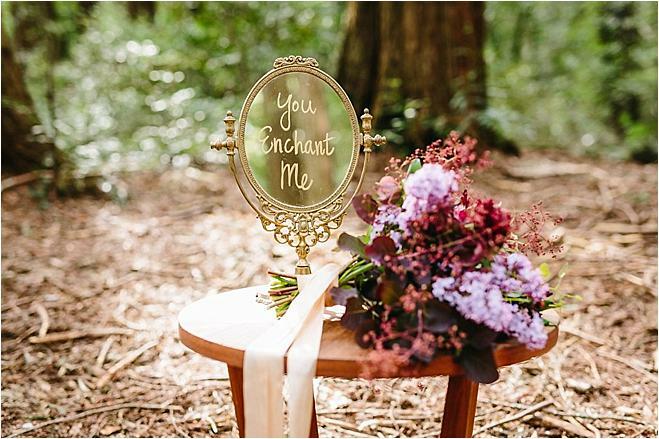 A sweet setup in the middle of a "fairy circle," one of the forest's natural clearings, showcased a golden mirror inscribed with "you enchant me," adding to the whimsical fairytale vibe of the shoot. 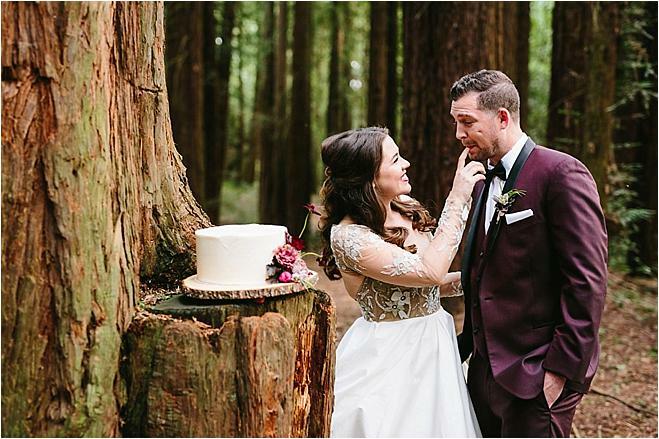 A beautiful cake by Susie Cakes adorned with the most gorgeous of florals served atop a wooden board was the cherry on top of this enchanting styled shoot!